Scroll down to view press cuttings of various obituary notices and tributes published in newspapers after William Parkin-Moore's death in 1937. These give some insight into the life of the man who inherited The Whitehall Estate and a significant fortune under the terms of his great uncle, George Moore's will. He further benefitted from a legacy left to him by George Moore's second wife, Agnes Jane Moore. Inheritance of his great uncle's legacy was conditional upon him adopting the name Moore*. William Parkin-Moore managed and farmed a large estate which in its heyday amounted to some 2000 acres. He was a respected agriculturalist and stockbreeder. A staunch Conservative, he served for many years as a JP and at the time of his death was Chairman of the Wigton Bench of Magistrates. *Today, it may seem a strange condition to attach to the inheritance and may be thought to imply something almost egocentric about George Moore, himself childless and desperate to see the name of Moore continue on after his death. However, it was not an uncommon practice for wealthy persons who had no offspring of their own to make such binding conditions in their wills and it was often resolved by hyphenating surnames. If you saw the TV programme 'Who Do You Think You Are' featuring the actor, Kevin Whatley, you may recall he encountered a similar situation with one of his ancestors. In 2008 the Daily Mail newspaper published a fascinating story about a rare Peugeot 5HP car, Registration AO-1, the first car ever to be registered in Cumbria back in December 1903. The newspaper reported the vehicle being put up for sale, having passed its MOT and with just 2,000 miles on the clock, for the sum of £100,000. This car had been purchased new by William Parkin-Moore who saw it in Peugeot's showroom on London's Brampton Road in the summer of 1902. He paid £185 (equivalent to £15,650 at 2008 prices). The following year Mr Parkin-Moore upgraded to a Daimler after deciding that the Peugeot's top speed of 28mph was not enough. The Peugeot spent the next 34 years in his garage, until his death in 1937, when his nephew Henry Donald inherited the vehicle. Henry never drove her and in 1944 gave the car to his brother George who kept her garaged until 1956. 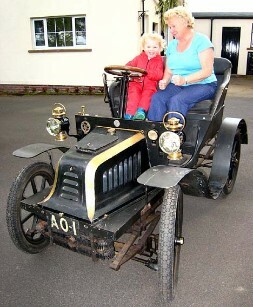 Then George passed the car on to his 18 year old son Dennis , who drove the vehicle around the village of Raughton Head. Now, in 2008 The Mail reports, Dennis's son Malcolm, the fifth and present owner, who himself has barely driven the car, is marketing it though car broker Gavin McGuire who is reported as saying, " This is a most remarkable car, not just because of her age but her condition. Many veteran cars have had parts replaced but not this one. 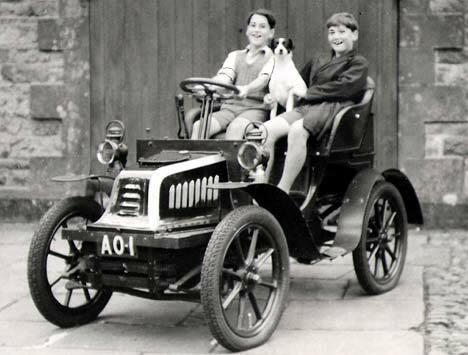 Anyone behind the wheel can experience what it was really like to drive an Edwardian car when it was new"
To view more means of transport used by the Parkin-Moore family at different times click here. When W. Parkin-Moore died in 1937 (having been pre-deceased by his eldest son George) the estate was broken up and sold, the house separately from the surrounding farmland. During the war it was used as a rest home for airmen stationed at nearby airfields. It was also occupied for most of the war by St. Aubyn's, an evacuated prep. school from the South-East of England, and finally it became a hotel but this venture was not successful. Whitehall was subsequently sold for demolition, and stripped of its fixtures and fittings, including the lead and slate on the roof of the manor house (The Ruins). A start was about to be made on the roof of the Pele tower when the goings-on were reported to the local council and it was pointed out that it was an ancient monument. The Council was forced to buy the property but did nothing for 18 months, after which they put a felt roof on the manor. But the house was now so wet that the result was the rot spreading through the structure, making the three story building unsafe. The Territorial Army was brought in to do some demolition practice, and they reduced the building to first floor level. In 1965 William Arnold Parkin-Moore (Grandson of William Parkin-Moore) bought Whitehall from the council and, with some help from the Historic Buildings Council, set about restoring the Pele tower, which by this time was in a very dilapidated state. He died in a canoeing accident in 1974 when his son, David was only six years old, and his widow, Susan, as trustee looked after the place until David Parkin-Moore inherited the property when he attained the age of 21 in 1989. My understanding is that Mrs Susan Parkin-Moore and her son David use the property today as a holiday home and a holiday let. View pictures of the interior today.